A new mouthwash developed by a microbiologist at the UCLA School of Dentistry is highly successful in targeting the harmful Streptococcus mutans bacteria that is the principal cause tooth decay and cavities. In a recent clinical study, 12 subjects who rinsed just one time with the experimental mouthwash experienced a nearly complete elimination of the S. mutans bacteria over the entire four-day testing period. Dental caries, commonly known as tooth decay or cavities, is one of the most common and costly infectious diseases in the United States, affecting more than 50 per cent of children and the vast majority of adults aged 18 and older. Americans spend more than $70 billion each year on dental services, with the majority of that amount going toward the treatment of dental caries. This new mouthwash is the product of nearly a decade of research conducted by Wenyuan Shi, chair of the oral biology section at the UCLA School of Dentistry. 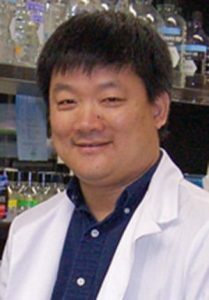 Shi developed a new antimicrobial technology called STAMP (specifically targeted anti-microbial peptides) with support from Colgate-Palmolive and from C3-Jian Inc., a company he founded around patent rights he developed at UCLA; the patents were exclusively licensed by UCLA to C3-Jian. The mouthwash uses a STAMP known as C16G2. The human body is home to millions of different bacteria, some of which cause diseases such as dental caries but many of which are vital for optimum health. Most common broad-spectrum antibiotics, like conventional mouthwash, indiscriminately kill both benign and harmful pathogenic organisms and only do so for a 12-hour time period. The overuse of broad-spectrum antibiotics can seriously disrupt the body’s normal ecological balance, rendering humans more susceptible to bacterial, yeast and parasitic infections. Shi’s Sm STAMP C16G2 investigational drug, tested in the clinical study, acts as a sort of “smart bomb,” eliminating only the harmful bacteria and remaining effective for an extended period. Based on the success of this limited clinical trial, C3-Jian Inc. has filed a New Investigational Drug application with the U.S. Food and Drug Administration, which is expected to begin more extensive clinical trials in March 2012. If the FDA ultimately approves Sm STAMP C16G2 for general use, it will be the first such anti–dental caries drug since fluoride was licensed nearly 60 years ago. “With this new antimicrobial technology, we have the prospect of actually wiping out tooth decay in our lifetime,” said Shi, who noted that this work may lay the foundation for developing additional target-specific “smart bomb” antimicrobials to combat other diseases. More extensive clinical trials may well demonstrate that the concept of targeted antimicrobial therapy is reality. If caries prevention becomes reality, perhaps appropriate emphasis may yet be placed on prevention of periodontal disease.